I just put my reloading bench together. My Forster Co Ax comes on Tuesday. I can’t wait to play with some new loads and more importantly, save a lot of money. I thought I saw an AT with the AX buttstock on a couple YouTube videos... shame it’s only for LE. I’ve had both an AT and AXMC in the past... and while a thumb hole stock certainly has that classic AI look, the newer AX buttstock is definitely more modern and comfortable. LOL! WRONG! You’ll just shoot more! Hahaha I’m hoping so! I’ve always bought FGMM for my precision rifles, so I’m looking forward to saving a few hundred dollars per thousand rounds. I literally have two 5 gallon buckets full of federal brass. You can either buy the kit and do it yourself or pay mile high like $100 more to do it. The LE comes with the but and basically saves LE guys $1,000. So, it’s not restricted to just us. Just basically like a discount or not having to pay for a modification. Mile High. Not sure when they are rolling out. They will basically be the same price as the regular AT, but with the AX stock. So you’re saving on the conversion. I forgot to ask if they will discount the conversion of a currently owned AT. Call mile high. They will be the ones handling it. If you’re able to pick up a factory AT LE I highly recommend it. If you’re not LE and are mechanically inclined I would pick up a non folder and do the conversion yourself. Mile High has stated they will only do the conversion on factory folders. Never thought I’d own one. Certainly exceeded my expectations. Absolute work of art. Looks like they put your bolt on the wrong side. I have found AI in VA very helpful. They may be able fix it for you. Wait... it all makes so much sense now. No wonder I have trouble running the bolt. Dude, left-handed AI's look funky! Also, you need a shorty on there to go with your S&B US! You know you wanna! 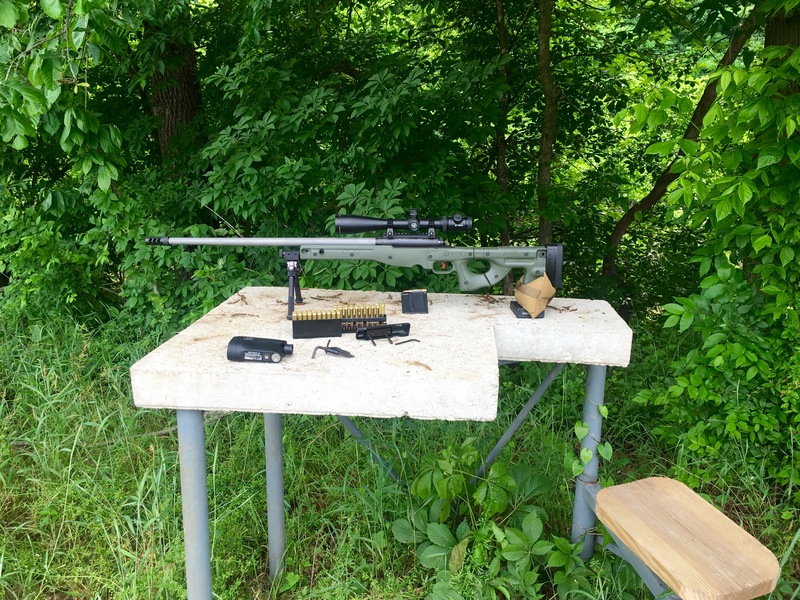 I was thinking about buying a shorty 308 and putting a TT 5–25 on it and keeping the S&B US on my 338LM. I think that makes the most sense. Anybody got a used AT laying around they want to sell? You know we have a equipment exchange right?? I've got a wtb thread started already. Just wanted to throw it in here just in case. Which model of spuhr do you have your kahles mounted in? It looks good, which is why I ask. Thanks for the reply. I get why there's a fanatical AI following. I always thought it was hype. It's not. If every AI shoots like this it's a well-deserved following. 19 rds down the barrel of my 338LM. 5-shot group at 102y. 285 ELD-M's. Total crap weather conditions - windy, cold, and wet. I've owned several big 338's and 300's, but I've never had a rifle settle on a load this fast. Amazing. Same here man. Shot my first match with my AT yesterday. Unbelievably smooth running. Anyone have a photo of a 18.5 Proof 308 barrel on an AXMC with suppressor? Or even without a can. Just curious how much barrel is out of the forend for can clearance. Thinking about a 18.5 or just snagging a 20. Today I got to test my first reloads out. Now time to narrow it down on the best 2 groups. Nice. I would shoot that 43.3 again. 4 in the same hole pretty much, is promising. Not a AI rifle but figured I would share it here. It’s one of the harder to find AICS for savage footprints. Built it out in 6.5 Creedmoor with a Criterion barrel from NSS. Only seen a handful of others in the savage footprint. Bit the bullet and bought a new AT nonfolder in green with the HRD arca rail and 22" MTU bartlien 6.5CM barrel. Buying thumb hole skins tomorrow. I think I’ve asked before, but don’t think anyone could answer. Has anyone tested the area419 12” arca lock keymod rail on the AT to see if it happens to work? The AI action is one of those few things that are special in the firearms industry. You can't quite express why it is special, it's just if you know you know. Anyone using a monopod or the Bugholes bag rider? Exact scenario as me. Lol. Mike got me hook line, sinker, and wallet. I dont regret it a bit. Can’t wait for it to dry and warm up. I get the feeling you where not talking About the rifle, but the weather instead.... werent you?? lol! Appreciate the offer but it’s sitting quite comfortable in the safe. I really like how this turned out. The AI is heavy but if I draw a NV cow elk or deer tag Im hunting with it! Had some time this morning and had an idea that fizzled out, but took some weight data on the AT folding chassis. Thumbhole skins are about 1oz heavier than the pistol grip ones. Forend skins are about 5 - 6oz for the pair. Did not weigh center skins. Cheek piece is a touch under 6 oz. with screws. Whole lotta metal in the forearm that could machined out it seems without defeating structural integrity. The AT chassis is a pig, but I definitely see places where “overbuilt” may not be adding durability, but only stability. Was thinking if one could do an MCM A or MCS T style grip on the AT skins, but the whole rear backbone would have to be modified... see attached picture. Backbone would need to curve down like the ARC Xylo. I’m sure someone here could machine it, but I think you’d have to completely remove the rear section and weld it back on. My AT is about to get an AX big brother. You don’t realize how addicting AI’s are until you own one. Lol that was fast, you had the AT for what two months..
It’s like an all new type of broke. AI broke = rifle rich. You buy one, you might as well buy 5! Nah. Just an ax308 sa. I don’t mess with much LA. And my AT barrels will fit. Though, once more stuff with the ASR rolls out, I’m going to be tempted if that’s the only configuration it eventually comes in. Looking for recommendations and previous art on pelican (or other) cases that hold an AI without the barrel attached and not in a standard “that’s a gun” length. I’d like to fly to some matches and have a pistol in there as well, started daydreaming about a 22 x 18 x 16 ish box with two or three levels of foam. Folded stock/action and mags on one, pistol and mags on the next, then 2-3 barrels on the top. Take a look at how the Covert is packaged and that may give you some ideas.